My wife reads lots of books. I like to stack things. Thus, when she suggested her Mother's Day present from me could be a couple of side tables, I jumped at the chance. It had been a while since my last construction project (long enough that I had forgotten my general lack of construction "craft") and I was hankering to add another modern touch to the house. 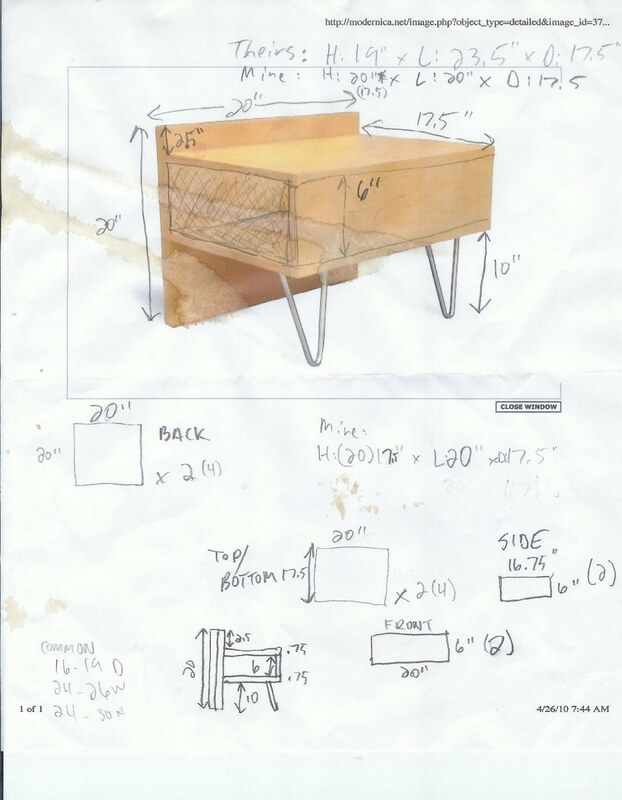 As a model, I took Modernica's "Case Study" side tables that they sell to go along with their Case Study Bed, which we have. However, Modernica's tables are $500 a pop, which seems exorbitant for something made out of Plywood that doesn't have "Eames" attached to it. Also, in my opinion they are too wide, and would basically look silly in our small bedroom. So, after some discussion, we settled on a smaller version, with an opening on the side in place of Modernica's single drawer. This would actually be more functional, since we were both looking to use the tables to store reading materials, something a drawer isn't really good for. 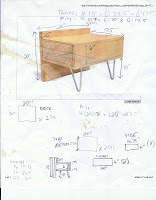 I'm posting a scan of my plans, showing Modernica's table with my dimensions and alterations. I settled on a 20x20 back, made of two pieces of 3/4" plywood glued together, with a top of 17.5x20, atop two 10" hairpin legs I ordered online. The opening would be 6-7 inches high, depending on how things went. "How things went" turned out to not be exactly as planned, but in the end, came out almost exactly as I had initially hoped, dimension-wise at least. The legs were bought from hairpinlegs.com and was easily the most expensive part of the project. For four legs plus shipping, the total was just under $100. They shipped pretty quickly, and once I had ordered them, I was committed to the project. The surprise, money-wise, was the affordable plywood I got from Sutherland's: $35 for a 4x8 sheet of 3/4 inch cabinet-grade birch. My plan would would take up almost all of that sheet, with enough left for scrap to keep me comfortable. On my last project I learned that perhaps the single most important component is being able to cut your pieces consistently, so I asked for a favor and had a friend cut my plywood on a very nice table saw in his shop rather than attempting it myself. Since I was making two matching pieces, this was important, and since I didn't want it made of anything except the plywood, it all had to match together nicely. The initial plan was for it all to be held together with carpenter's glue, with just a few screw supports in the back. That ended up changing as I decided to screw into the upright pieces from the bottom of the table. This was fine, though, because you can't see those screws, or the ones in the back. So it basically looks held together without screws or nails although it is very sturdy. My biggest miscalculation was not realizing that the 10-inch legs weren't actually 10-inches high because they sit at an angle. This meant my tabletop wasn't high enough when first assembled. I remedied this by 1) cutting a scrap piece to attach the legs to which was in turn attached to the bottom of the table and 2) making the riser piece 7 inches instead of 6. With those changes made, I got to my target numbers of the initial design. Prior to this, as you can see in this picture of the table clamped together for assembly, the design looked goofy, with the back of the table far too tall. You can also see an essential tool for this job: "Quick Grips" to hold the pieces in place as you screw as well as hold them tight for glue to bond. In the end, I have again confirmed that I am more designer than craftsman. I enjoy the process of building, but I would be better off having someone with more patience and skill put the thing together. Another mistake I made was putting too much polyurethane on the top pieces, which I did with multiple layers, sanding between each. Still, the end product is pretty sweet plywood modern furniture. Total price, just under $200 for both tables.